Organist Thomas Gaynor will perform in the next “Rising Star Recital” featured in Hendricks Chapel’s Malmgren Concert Series on Sunday, April 6. The concert will begin at 4 p.m. and is free and open to the public. Free parking will be available in the Irving Garage. Gaynor will perform works by Bach, Schumann, Dupré and Prokofiev during the concert. A native of Wellington, New Zealand, Gaynor was an organ scholar and honorary sub-organist at St. Paul’s Cathedral in Wellington. He is currently pursuing a master of music degree at the Eastman School of Music in Rochester, where he studies with David Higgs. 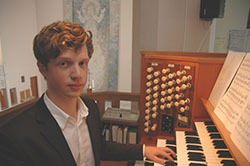 In 2013, Gaynor was awarded second prize in the Arthur Poister Competition in Organ Playing and he was a finalist in the Longwood Gardens International Organ Competition. The concert is part of the Malmgren Concert Series at Hendricks Chapel. The series was made possible by a generous gift to Hendricks Chapel from alumna Esther Malmgren ’42 in 1991. The free concerts, held throughout the year, feature a variety of music. The Hendricks Chapel Choir Spring Concert will be held on Sunday, April 27, at Hendricks Chapel. Call Hendricks Chapel at 315-443-2901 for more information.